Twitter has rolled out a new service called Lead Generation Cards which will be of interest to anyone who is actively building a list. This article will show you how to integrate Twitter Lead Generation Cards with RocketResponder. Basically it is a tool which helps advertisers find people who are interested in the goods or services they provide. So for example you could sign up to a blog, website or newsletter just by pressing a “sign up” link without even having to enter your email address. Outdoor gear and apparel company Rock/Creek reported gaining more than 1,700 new email contacts in under a week when it used the Lead Generation Card in a Promoted Tweet campaign. RocketResponder’s Tim Linden set up a Lead Generation Card to gain sign ups to his blog. Here Tim explains how to get subscribers to your blog using Twitter’s Lead Generation Cards. If you’re a Twitter Hot Shot then you’ll LOVE this. 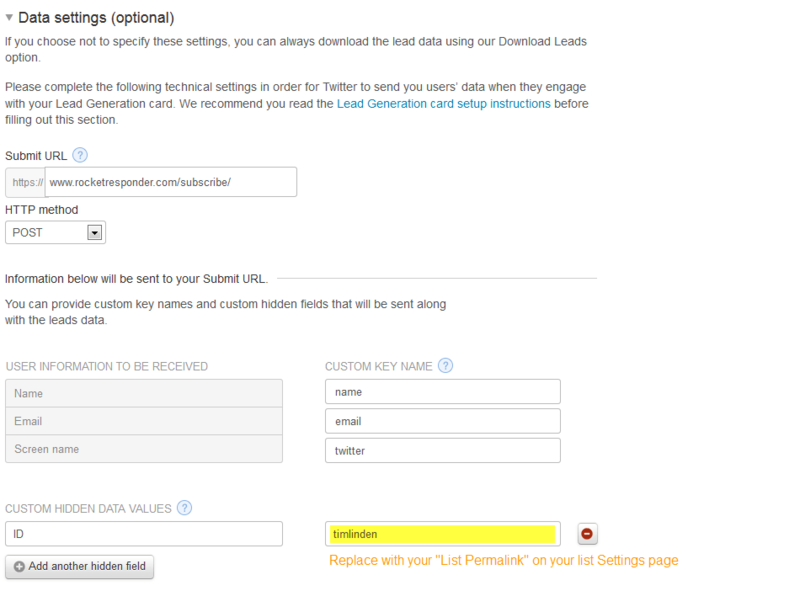 You can now create Twitter Lead Generation Cards that let your followers easily subscribe to your list with one click. It integrates perfectly into RocketResponder, so get excited! Change the Twitter Card “Data Settings” to the settings below. This will integrate directly with RocketResponder so when users hit subscribe they are on your list! Click to view it bigger. The only difference you’ll need is highlighted in yellow, that’s my list’s permalink, you’ll want to use yours! Step 3: Tweet your new Lead Generation Card! Perhaps it was a deliberate marketing ploy – I heard, via social media sites, that this particular email received an impressive open rate. However it is far more likely that it was one of those simple, old-fashioned mistakes that we tend to make from time to time. However it is easy to have some urgent or important news that you want to get out so quickly that you hurry to send out the email without checking it over first. And that is when you can totally forget to add the subject line. So take your time and get things right. Remember that with RocketResponder you have the opportunity to send any new email to yourself first before you send it to your list. Take advantage of this feature. It is far better to have your mistake broadcast only to you rather than your entire list. Now simply edit out the mistake and send the amended email out to your subscribers.